Whether or not you’re a Lego aficionado, you might find this mechanism for drawing a spirograph-like design intriguing. Technically it’s not a hypotrochoid like a spirograph pattern produced inside a ring. Rather, it’s a pintograph, produced by a pen held by two mechanical arms attached to rotating wheels – a variation of a harmonograph which is produced by a pendulum mechanism. 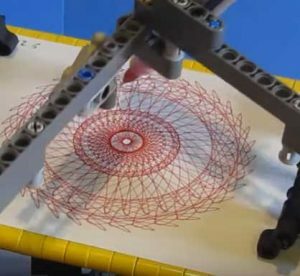 This Lego pintograph, however, has a rotating table, so it produces a radially-symmetrical design – like a hypotrochoid. By controlling the speed of the rotation, as well as the lengths of the arms, many different designs can be produced. The builder goes by the name of PG52, and he’s apparently French. His machine went through several generations. Below I’ll show his videos for Version 4 and Version 5. Narration of the first is in French but there are English subtitles. If you’re into LEGO Technic and can read French, you may be interested in what he shared on a LEGO Technic forum at http://www.techlug.fr/Forum/topic7691-30.html – or just examine the pictures. Merci PG52, où que tu sois.